Much of the historic town of Taos can be enjoyed on foot, since Taos Plazaringed by galleries, shops, Northern New Mexico restaurants and an assortment of historic sitesis the heart of the community. Basque explorer Don Juan de Oñate arrived in Taos in July 1598, established a mission and negotiated trading arrangements with the residents of Taos Pueblo. 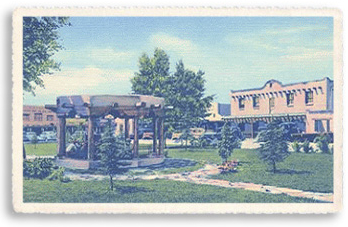 The settlement developed into two Plazas: the Plaza at the heart of the town became a thriving business district for the early colony, and a walled residential plaza was constructed a few hundred yards behind. Most of the buildings around the Plaza are old; however, since Taos has always been plagued by fires, none of the Plaza's buildings predate the 19th century. The covered gazebo was donated by heiress and longtime Taos resident Mabel Dodge Luhan. And on the southeastern corner of Taos Plaza is the historic Hotel La Fonda de Taos. The end of July brings the annual Fiestas de Santa Ana y Santiago, a weekend-long celebration where the Plaza is filled with music, food and dance. Enjoy Award Winning Black Mesa Wines By the Glass or Bottle & Live Entertainment Fri. & Sat. A Taos Tradition for Great Food & Drink, Live Music, Dancing, Pool, Pichonette & More!